These beautiful old windows have outlived the original frames,and have been rehoused in substantial pine frames. It was removed from a house in NORTHUMBERLAND during refurbishement. This is a PRETTY PAIR OF windows of outstanding beauty with exceptional coloured glass.BLUES - REDS - GREENS - BLUSH PINKS This coloured glass is of a heavy and deep texture. 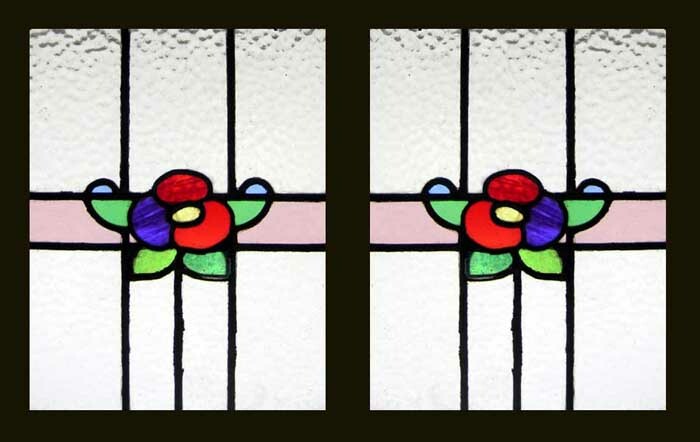 A BEAUTIFUL FLORAL DESIGN CASCADING ACROSS THE WINDOWS - The leads are in sound condition. The frames each measure 16 W" x 20 3/4H" . The glass measures 13 1/4 " x 18 " . Shipping and packing for USA would be $139. You can buy this now on credit card using the secure server paypal or woldpay link below the photograph or e-mail sales click here to arrange payment by personal check ,money order or bank transfer.